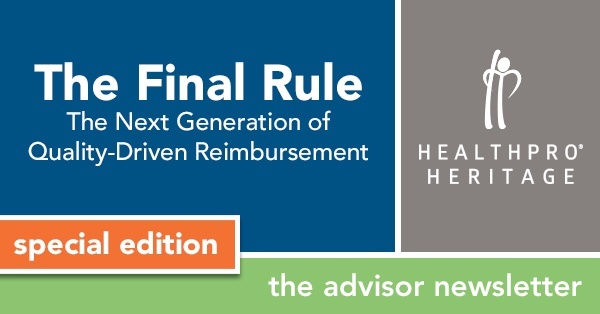 CMS’ proposed next-generation reimbursement system has been revealed, and HealthPRO®/Heritage will set the pace as THE PREMIERE STRATEGIC PARTNER – ready to inform, guide, and help build strategy in response to proposed changes of the Final Rule, including the Resident Classification System, Version I (RCS-I). Late last week on April 27, CMS outlined the Final Rule and Pre-Final Rule. Among the dramatic, all-encompassing proposed changes is the transition from RUGS-IV to RCS-1 that will take place in October 2018. As thought-leaders, these proposed changes come as no surprise to HealthPRO®/Heritage. 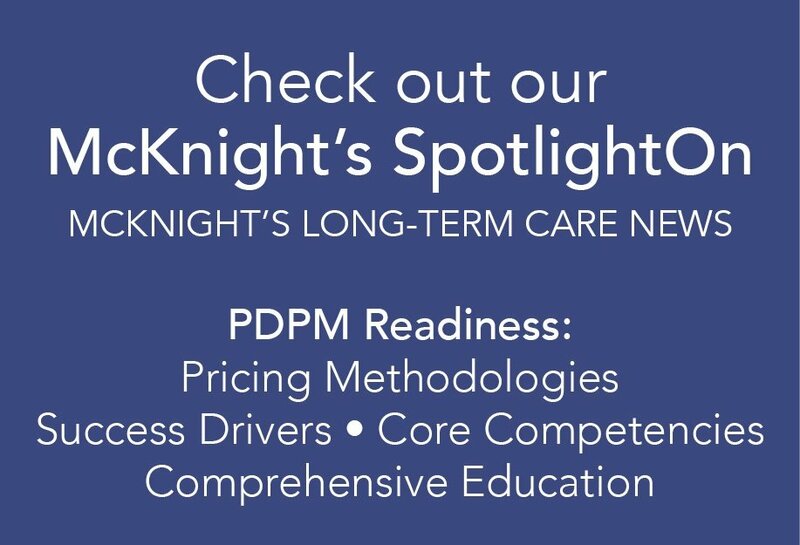 In fact, this shift to a quality-driven reimbursement system is directly aligned with the HealthPRO®/Heritage philosophy. For more than five years – since the onset of the IMPACT Act and the Triple Aim – HealthPRO®/Heritage has embraced clinical strategies, compliance programming, and an operational approach that puts us squarely in line with the expectations proposed in CMS’s Final Rule. In short, we have already made the necessary changes to ensure YOUR success in the new world of health care reform as it will look in 2018 and beyond. You can trust HealthPRO®/Heritage to help navigate the turbulent road over the next 18 months and beyond. Details related to proposed regulatory changes, including the inception of RCS-1, will be outlined by HealthPRO®/Heritage subject-matter-experts during an "Open Door” webinar on Wednesday, May 10 at 1:00 PM EDT. Register now! While many other therapy providers have been driven by a minutes/utilization focus, HealthPRO®/Heritage is decidedly patient-focused, encouraging clinicians and managers to drive patient treatment plans based on clinical evaluation and need utilizing standardized, evidence-based testing, prioritizing patient-centric goals, etc. Important to note: Proposed changes from a minute-based system reflect this fundamental area of concern that has plagued the industry for years. Many studies and reviews concerning the “overutilization of therapy” and “thresholding” of therapy minutes are now in the spotlight. HealthPRO®/Heritage is proud to continue to uphold our position that patient-centered care that aligns with quality functional outcomes will continue to drive our therapy programming. Since 1997, HealthPRO®/Heritage has focused on collecting outcomes and using these metrics to support clinical decision-making. Our sophisticated, proprietary documentation/outcomes reporting IT system continues to be the industry’s best platform for tracking, reporting, and managing metrics. Important to note: In 2014 – well before it was mandatory to do so – HealthPRO®/Heritage was the first to integrate CMS’ Care Tool into our proprietary documentation/outcomes tracking IT system, demonstrating our commitment to gathering, managing, and leveraging outcomes data (as defined by CMS). Many other therapy programs may struggle with designing, implementing, and extracting data necessary to be successful in the new proposed world of RCS-1. Important to note: Reimbursement levels will be set based on clinical and functional parameters and will be tied to a facility’s ability to manage length of stay in the proposed Final Rule. This will require providers to have well-established clinical pathways/programs in place that can demonstrate measurable success. HealthPRO®/Heritage understands the larger landscape of comprehensive health care reform. As such, though it may seem these proposed changes will only impact the skilled nursing industry, downstream partners need to understand how the implications of the proposed Final Rule will impact the behaviors of SNF partners so they can prepare to align with the philosophical approach to caring for clinically complex patients, LOS management, rehospitalization rates, etc. that will ultimately impact cross-continuum relationships/networks. expectations outlined in the Final Rule. Like many industry leaders, HealthPRO®/Heritage has navigated significant changes in healthcare over the past two decades. This upcoming set of challenges will be no different. HealthPRO®/Heritage is perfectly positioned to support our clients in keeping ahead of the curve as the Final Rule takes shape. As PAC providers begin to digest the proposed changes, CMS is accepting comments on both the Final Rule for FY 2018 and the Pre-Rule for FY 2019 through June 26, 2017. HealthPRO®/Heritage will stay dialed-in as commentary and feedback from thought-leaders are gathered and reviewed. We look forward to what might perhaps be a unified system focused on improved healthcare delivery as a result of several systems and platforms contributing to what might be the future of post-acute care. Stay tuned!